New Technology and Polymer Centre! 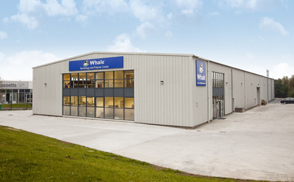 Whale has just opened the doors on its new second factory located only 5 minutes from its current Headquarters in Bangor, Northern Ireland. This new building doubles Whale’s operations and engineering facility and ensures the company infrastructure can keep pace with the business growth. The additional space created allows expansion of the company’s already sophisticated testing laboratory to expand to include a full scale cold test chamber, thermal imaging technology, upgraded wind testing chamber, software development and polymer analysis. Whale’s own injection moulding capability is core to Whale’s commitment to Quality. With the expansion, the new factory enables this core competency to expand further in line with the increasing demand. This investment in additional premises and technologies is one of the most significant in the company’s long (200 year) history signalling a long term commitment to the industry, UK manufacturing and its employees. Whale’s bespoke cold chamber (9mx 4.5mx 4m), thermal imaging and wind testing facility ensure that we develop heating products to withstand extreme weather conditions in accordance with BS grade 3 classification of thermal insulation and heating. Typical installation and field testing also give us hands on experience of their performance. During the last 12 months, Whale has also invested heavily in the latest Rapid Prototyping Machines. The company’s trained rapid prototype engineers take an initial CAD model to produce prototyped parts at speed. The machines produce accurate, functionally compliant and highly finished components in a wide spectrum of materials and can create models combining both plastic and rubber parts. This accelerates research and design processes bringing conceptions to market quicker than ever before.